Medi-Cal Expansion: Full Steam Ahead or on the Slow Track? Medi-Cal – our state’s Medicaid Program – provides health coverage to well over 7 million low-income Californians, primarily children, youth, and women. The program soon will cover hundreds of thousands of additional residents as part of an expansion authorized by federal health care reform. Under the expansion, California will extend Medi-Cal coverage to parents and childless adults who are currently excluded from the program and whose incomes do not exceed 138 percent of the federal poverty line (see chart). But is California on track to expand Medi-Cal by January 1, 2014? That’s the date when the federal government will begin paying the full cost of the expansion for the first three years, phasing down to a still-high 90 percent of the cost by 2020. With less than nine months to go, and much work left to do, there is considerable concern that the state isn’t moving quickly enough to ensure a timely expansion of Medi-Cal. We take an in-depth look at the Medi-Cal expansion – and the debate surrounding it – in a new CBP report released yesterday: Expanding Horizons: Key Facts About the Medi-Cal Program as California Implements Health Care Reform. In addition to providing a comprehensive overview of the program, our report highlights significant differences of opinion that have emerged regarding the Medi-Cal expansion. For instance, identical bills moving through the Assembly and Senate (AB X1 1 and SB X1 1) envision a state-led expansion, an approach endorsed by the nonpartisan Legislative Analyst’s Office (LAO). In contrast, Governor Brown has suggested that either the state or the counties could lead the expansion, a position the Governor has maintained since January despite major concerns that counties, health advocates, and the LAO have raised about the county-led option. Another point of contention is the Governor’s decision to link the Medi-Cal expansion to his proposal to “capture,” for the state’s benefit, some of the state dollars that counties now use to provide health care to low-income, uninsured (“medically indigent”) Californians – many of whom would enroll in Medi-Cal under the expansion. The Governor’s proposal has generated concern among county officials and health advocates, who worry that the state may shift too much funding, too soon, from a county health care safety net that is sorely in need of new investments and will remain in high demand even after health care reform is fully implemented. Our report concludes that policymakers should move quickly to put in place the changes needed to ensure a successful, state-led expansion of Medi-Cal by January 1, 2014. Starting the expansion after that date would leave federal dollars on the table and delay coverage for hundreds of thousands of low-income Californians. We also suggest that policymakers consider taking a “wait and see” approach as to the appropriate level of state funding for county indigent health care services. At the moment, it’s unclear how the Medi-Cal expansion will affect the use and the cost of the county health care safety net. This picture will come into focus over the next few years, at which point lawmakers – armed with better information – could revisit the Governor’s proposal to shift county indigent health care dollars to the state. 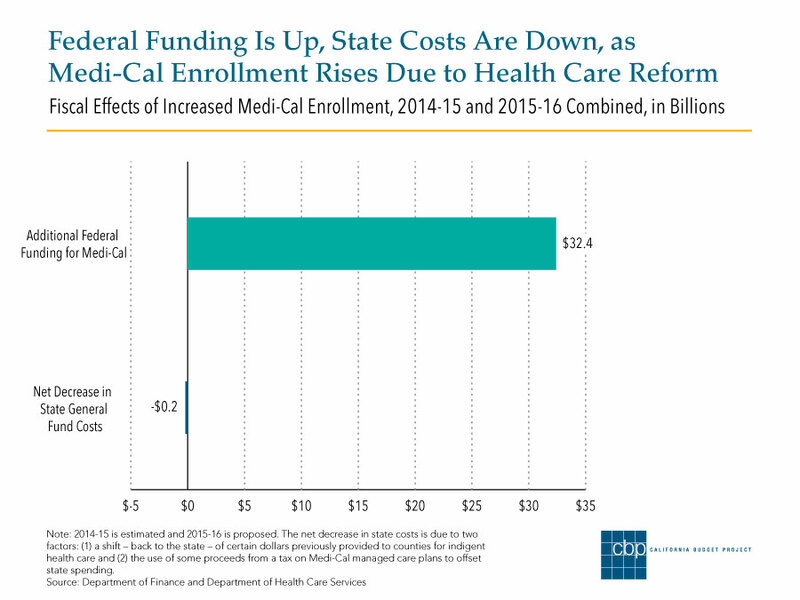 Finally, we note that California’s improving fiscal situation provides an opportunity for policymakers to reconsider reductions made to Medi-Cal in recent years, some of which are highlighted in our report. This includes the deep cut to provider payments that has been subject to legal challenges, but which could go into effect this year if upheld by the federal courts – on the eve of the Medi-Cal expansion. Now that both the House and Senate have passed a version of health care reform, Congress must navigate one final step before any bill lands on President Obama’s desk. A conference committee next month will combine the two plans into one bill. One element that will certainly loom large: Subsidies to help low- and middle-income families purchase health coverage. Both the House and Senate plans establish a new insurance “exchange’’ that would offer a range of plans with different levels of premiums, benefits, and cost-sharing. Subsidies would be available for certain individuals and families to purchase coverage through that exchange. The amount of the subsidy would be tied to either the second-least-expensive plan or an average of the three lowest-cost plans available through the exchange. Those who opt for more expensive coverage would pay for the additional costs themselves. Congressional Budget Office analyses of the two plans show that the House version would offer more assistance to lower-income families than the Senate version. In fact, while the Senate version does more to reduce costs for those with moderate incomes, it does so at the expense of those with lower incomes, as these two tables show. A more robust Medicaid expansion: Everyone, including nonelderly adults without children, would generally qualify for Medicaid – Medi-Cal in California – with incomes up to 150 percent of the poverty line, or an annual income of up to $16,245 in 2009. In the Senate version, the cut-off for Medicaid is 133 percent of the poverty line, or an annual income of up to $14,404. In California, 123,000 more people would be newly eligible under the House version than the Senate version of the bill. A stronger employer mandate: The House version requires businesses to provide “qualifying insurance” coverage to employees and pay a substantial share toward premiums or pay a penalty equal to 8 percent of payroll. The Senate version encourages employers with more than 50 employees to purchase coverage, but the requirement is less prescriptive and the penalty far less severe, equal to $750 for each full-time worker if any of the firm’s employees obtain subsidized coverage through the exchange. To the extent that individuals can buy coverage through a “group,’’ such as an employer, it spreads the risk and cost of insurance and thus lowers premiums. The one caveat in the House version is that employees who are offered qualifying coverage through their employer must take that option, even if the coverage is inferior and costs are higher than the health plans available with subsidies. Workers who would have to pay more than 12 percent of their income toward their employer’s insurance, however, could receive subsidies to purchase coverage through the exchange. The success of health reform – particularly a plan that requires everyone to have health insurance – hinges on the ability of families to pay for the health care they need without significant financial strain. Health care reform that proves unaffordable to families with low incomes could hinder health reform’s success. As we have said and shown before, even without health expenses, a single adult in California would need to earn at least $24,760 to pay for basic needs such as housing, transportation, and food, not including health care. With or without a public option, any health reform that emerges from conference committee needs to contain adequate subsidies that will keep coverage affordable for millions of individuals and families. Even as Congress wrangles over the details of a health reform package, one aspect seems fairly noncontroversial: More low-income adults should be able to obtain health coverage through Medicaid (Medi-Cal in California). Under current law, adults between ages 19 and 64 generally only qualify for Medi-Cal if they are disabled, pregnant, or have dependent children. However, all three of the primary Congressional health reform bills propose to extend Medicaid to adults who do not have dependent children as long as they meet the income threshold, which ranges to 150 percent of the federal poverty line, depending on the proposal. For a single adult, this translates to an income of up to $16,245 per year in 2009. This provision to expand Medi-Cal, alone, could put an enormous dent in California’s uninsured population. More than 1 million childless adults have incomes below 150 percent of the poverty line and could qualify for Medi-Cal. 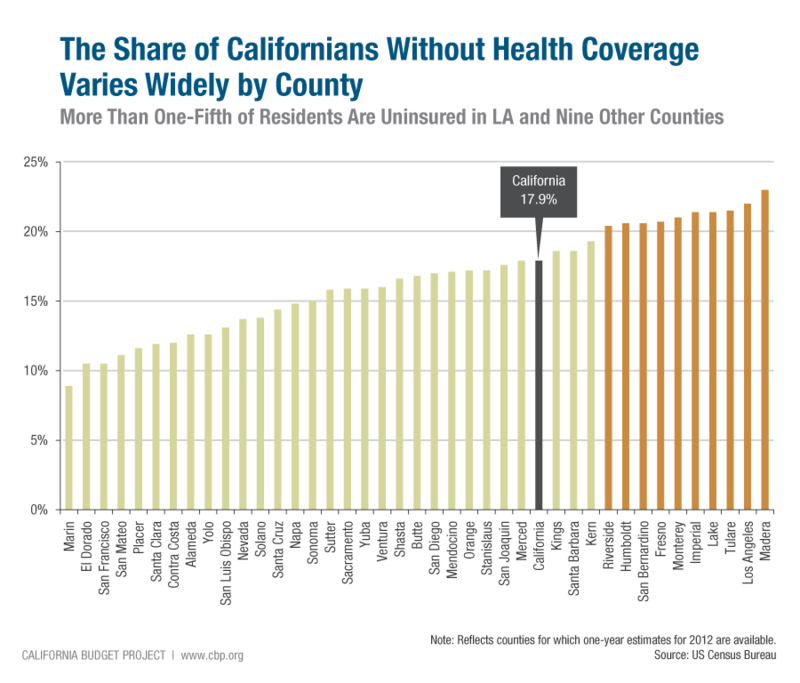 Expanding coverage to this population is sound public policy that would ensure the lowest-income Californians have coverage and access to preventive medical services in order to avoid more costly medical care later.